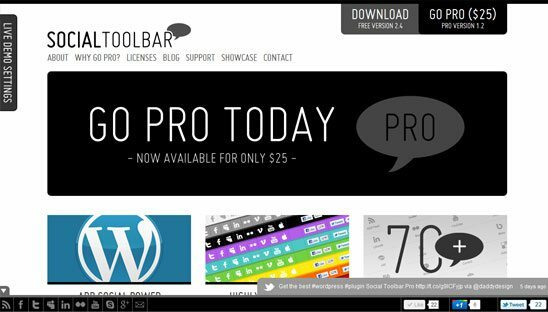 This premium wordpress Plugin is for adding a highly customizable toolbar with color selection, social network icons, recent tweet and share buttons into footer or header of a wordpress website. Social Toolbar Pro will display your latest tweet, list your social networking profiles (over 70 social network profiles to choose from in PRO), and allow users to “Like” your page/post on Facebook, Google +1 your page/post and tweet about it on Twitter! You can also specify colors on just about every detail on it including the background, border, social icons, recent tweet background and fonts. Select your social network icons and you can also rearrange your icons to your desired display order. On top of that you can also upload your own custom icon. We went with a very clean easy to navigate wordpress design. The plugin used for the product purchase section is called WP eStore. Many great pages and sections on this very advanced wordpress website: about, blog, FAQs, icons available, forum (coming soon), contact form, update plugin form, showcase and many more. One of the coolest features on this site (besides the Toolbar of course) is the DEMO tester on the left. Go ahead and play with the settings, it will show you some of the cool customization settings the toolbar has to offer. We also created a custom Facebook tab using Fan Gate for a $5 off coupon code.